Miles Davis (Miles Dewey Davis III, Alton, Illinois, May 26, 1926 ? Santa Monica, California, September 28, 1991) was an American trumpeter, bandleader and composer. Widely considered one of the most influential musicians of the 20th century, Miles Davis was, with his musical groups, at the forefront of several major developments in jazz music, including bebop, cool jazz, hard bop, modal jazz, and jazz fusion. Davis' mother, Cleota Mae (Henry) Davis, wanted her son to learn the piano; she was a capable blues pianist but kept this fact hidden from her son. His musical studies began at 13, when his father gave him a trumpet and arranged lessons with local musician Elwood Buchanan. Davis later suggested that his father's instrument choice was made largely to irk his wife, who disliked the trumpet's sound. Against the fashion of the time, Buchanan stressed the importance of playing without vibrato; he was reported to have slapped Davis' knuckles every time he started using heavy vibrato. Davis would carry his clear signature tone throughout his career. He once remarked on its importance to him, saying, "I prefer a round sound with no attitude in it, like a round voice with not too much tremolo and not too much bass. Just right in the middle. If I can't get that sound I can't play anything." Clark Terry was another important early influence. Davis began playing professionally, performing in several 52nd Street clubs with Coleman Hawkins and Eddie "Lockjaw" Davis. In 1945, he entered a recording studio for the first time, as a member of Herbie Fields's group. This was the first of many recordings to which Davis contributed in this period, mostly as a sideman. He finally got the chance to record as a leader in 1946, with an occasional group called the Miles Davis Sextet plus Earl Coleman and Ann Hathaway?one of the rare occasions when Davis, by then a member of the groundbreaking Charlie Parker Quintet, can be heard accompanying singers. In these early years, recording sessions where Davis was the leader were the exception rather than the rule; his next date as leader would not come until 1947. The importance of the nonet experience would become clear to critics and the larger public only in later years, but, at least commercially, the nonet was not a success. The liner notes of the first recordings of the Davis Quintet for Columbia Records call it one of the most spectacular failures of the jazz club scene. This was bitterly noted by Davis, who claimed the invention of the cool style and resented the success that was later enjoyed?in large part because of the media's attention?by white "cool jazz" musicians (Mulligan and Dave Brubeck in particular). Despite all the personal turmoil, the 1950?54 period was actually quite fruitful for Davis artistically. He made quite a number of recordings and had several collaborations with other important musicians. He got to know the music of Chicago pianist Ahmad Jamal, whose elegant approach and use of space influenced him deeply. He also definitively severed his stylistic ties with bebop. The repertoire included many bebop mainstays, standards from the Great American Songbook and the pre-bop era, and some traditional tunes. The prevailing style of the group was a development of the Davis experience in the previous years?Davis playing long, legato, and essentially melodic lines, while Coltrane, who during these years emerged as a leading figure on the musical scene, contrasted by playing high-energy solos. The quintet was disbanded for the first time in 1957, following a series of personal problems that Davis blames on the drug addiction of the other musicians. Davis played some gigs at the Cafe Bohemia with a short-lived formation that included Sonny Rollins and drummer Art Taylor, and then traveled to France, where he recorded the score to Louis Malle's film Ascenseur pour l'?chafaud. With the aid of French session musicians Barney Wilen, Pierre Michelot, and Ren&eacute; Urtreger, and American drummer Kenny Clarke, he recorded the entire soundtrack with an innovative procedure, without relying on written material: starting from sparse indication of the harmony and a general feel of a given piece, the group played by watching the movie on a screen in front of them and improvising. Almost immediately after the recording of Milestones, Davis fired Garland and, shortly afterward, Jones, again for behavioral problems; he replaced them with Bill Evans?a young white pianist with a strong classical background?and drummer Jimmy Cobb. With this revamped formation, Davis began a year during which the sextet performed and toured extensively and produced a record (1958 Miles, also known as 58 Sessions). Evans had a unique, impressionistic approach to the piano, and his musical ideas had a strong influence on Davis. But after only eight months on the road with the group, he was burned out and left. He was soon replaced by Wynton Kelly, a player who brought to the sextet a swinging, bluesy approach that contrasted with Evans' more delicate playing. In the late 1950s and early 1960s, Davis recorded a series of albums with Gil Evans, often playing flugelhorn as well as trumpet. The first, Miles Ahead (1957), showcased his playing with a jazz big band and a horn section arranged by Evans. Songs included Dave Brubeck's "The Duke," as well as L&eacute;o Delibes's "The Maids of Cadiz," the first piece of European classical music Davis had recorded. Another distinctive feature of the album was the orchestral passages that Evans had devised as transitions between the different tracks, which were joined together with the innovative use of editing in the post-production phase, turning each side of the album into a seamless piece of music. Sketches Of Spain (1959?1960) featured songs by contemporary Spanish composer Joaquin Rodrigo and also Manuel de Falla, as well as Gil Evans originals with a Spanish flavor. Miles Davis At Carnegie Hall (1961) includes Rodrigo's Concierto de Aranjuez, along with other compositions recorded in concert with an orchestra under Evans' direction. In March and April 1959, Davis re-entered the studio with his working sextet to record what is widely considered his magnum opus, Kind of Blue. He called back Bill Evans, months away from forming what would become his own seminal trio, for the album sessions, as the music had been planned around Evans' piano style. Both Davis and Evans were personally acquainted with the ideas of pianist George Russell regarding modal jazz, Davis from discussions with Russell and others before the Birth of the Cool sessions, and Evans from study with Russell in 1956. Davis, however, had neglected to inform current pianist Kelly of Evans' role in the recordings; Kelly subsequently played only on the track "Freddie Freeloader" and was not present at the April dates for the album. "So What" and "All Blues" had been played by the sextet at performances prior to the recording sessions, but for the other three compositions, Davis and Evans prepared skeletal harmonic frameworks that the other musicians saw for the first time on the day of recording, to allow a fresher approach to their improvisations. The resulting album has proven to be both highly popular and enormously influential. According to the RIAA, Kind of Blue is the best-selling jazz album of all time, having been certified as quadruple platinum (4 million copies sold). In December 2009, the US House of Representatives voted 409?0 to pass a resolution honoring the album as a national treasure. In 1972, Davis was introduced to the music of Karlheinz Stockhausen by Paul Buckmaster, leading to a period of new creative exploration. Biographer J. K. Chambers wrote that "the effect of Davis' study of Stockhausen could not be repressed for long. . . . Davis' own 'space music' shows Stockhausen's influence compositionally." His recordings and performances during this period were described as "space music" by fans, by music critic Leonard Feather, and by Buckmaster, who described it as "a lot of mood changes?heavy, dark, intense?definitely space music." By 1979, Davis had rekindled his relationship with actress Cicely Tyson. With Tyson, Davis would overcome his cocaine addiction and regain his enthusiasm for music. As he had not played trumpet for the better part of three years, regaining his famed embouchure proved to be particularly arduous. While recording The Man With The Horn (sessions were spread sporadically over 1979?1981), Davis played mostly wahwah with a younger, larger band. Having first taken part in the Artists United Against Apartheid recording, Davis signed with Warner Brothers records and reunited with Marcus Miller. The resulting record, Tutu (1986), would be his first to use modern studio tools ? programmed synthesizers, samples and drum loops ? to create an entirely new setting for Davis' playing. Ecstatically reviewed on its release, the album would frequently be described as the modern counterpart of Sketches of Spain and won a Grammy in 1987. 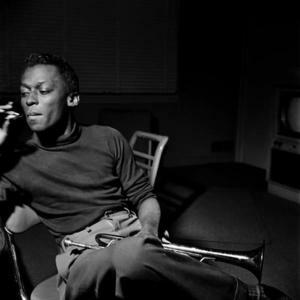 Miles Davis is regarded as one of the most innovative, influential and respected figures in the history of jazz music. He has been described as ?one of the great innovators in jazz?. The Rolling Stone Encyclopedia of Rock & Roll noted "Miles Davis played a crucial and inevitably controversial role in every major development in jazz since the mid-'40s, and no other jazz musician has had so profound an effect on rock. Miles Davis was the most widely recognized jazz musician of his era, an outspoken social critic and an arbiter of style - in attitude and fashion - as well as music". His album Kind of Blue is the best-selling album in the history of jazz music and was praised by the United States House of Representatives to "pass a symbolic resolution honoring the masterpiece and reaffirming jazz as a national treasure." As an innovative bandleader and composer, Miles Davis has influenced many notable musicians and bands from diverse genres. These include Wayne Shorter, Cannonball Adderley, Herbie Hancock, Lalo Schifrin, Tangerine Dream, Brand X, Mtume, Benny Bailey, Joe Bonner, Don Cherry, Urszula Dudziak, Bill Evans, Bill Hardman, The Lounge Lizards, Hugh Masekela , John McLaughlin, King Crimson, Steely Dan, Frank Zappa, Radiohead, The Flaming Lips, Lydia Lunch, Talk Talk, Michael Franks, Sting, Lonnie Liston Smith, Ji?&iacute; Stiv&iacute;n, Tim Hagans, Julie Christensen, Vassar Clements, Snooky Young, Prince and Christian Scott. In 1986, the New England Conservatory awarded Miles Davis an Honorary Doctorate for his extraordinary contributions to music. Since 1960 the National Academy of Recording Arts and Sciences (NARAS) has honored him with eight Grammy Awards, a Grammy Lifetime Achievement Award, and three Grammy Hall of Fame Awards.